Hot Damn! A new John Rector book! John Rector has become a must-read author for me. Each of his books have been great page-turners that strike a balance between plots that are blistering paced yet detailed and well-fleshed out. This offering is no exception, and I found myself rushing through this page-turner; all the while trying to tell myself to slow down and enjoy all the things Rector did right in this novel. The Ridge is one hell of a good suspense novel and even the most discerning reader will find themselves struggling to put this book down. 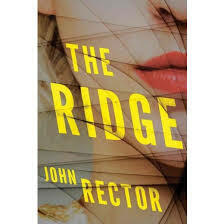 In a clear homage to The Stepford Wives (it is referenced many times in the book), Rector paints a compelling story of Megan Stokes, a young wife who has left her comfort zone in Chicago, and has moved with her husband to the quaint and quiet town of Willow Ridge. Megan is uncomfortable within the skin of this community and it comes boiling out when she interacts with Rachel Addison, who Megan believes has become infatuated with her husband. Their interaction takes a turn for worse and leaves Megan facing at best a manslaughter rap and at worst, a murder rap. But when her situation takes a turn into the unexplained and Rachel turns up very much alive, yet “different”, the screws begin to get tightened under Rector’s deft touch. With each step Rachel tries to take to determine what is really happening in this strange new town, she finds potential friends and potential enemies all around her, often in the form of the same person. The reader will not know what is real and who can be trusted, as they navigate the dark corners of Willow Ridge with Rector surprising them at every turn. Rector is at his best when his writing leaves the reader unsure of what can be believed and what is real (His top work in my eyes, which follows that blueprint, is The Grove). He has penned a novel that will impresses new readers and satisfy his legions of fans. This book is sure to be well-received in many reading circles and will generate a lot of buzz for Rector. A smart reader may be left with the feeling this book reads very similarly to Blake Crouch’s Wayward Pines novel. That smart reader wouldn’t be too surprised to see Rector give a shout out to Crouch in the acknowledgements and in fact, receives a blurb from him for the book. If the smart reader were to dig a little deeper, they would discover the Wayward Pines series and The Ridge share the same publisher. By coincidence or by design; Well I leave that up to you to decide. But seeing how Wayward Pines launched a successful TV series, one can hardly fault Rector for using the format laid out by Crouch. This book leaves a lot of openings for spin-offs and sequels. I, for one, would welcome the chance to follow this wormhole, wherever it may lead.